When it comes to eating healthy there are two words you don't want to hear - "SUPER BOWL!" How do you enjoy a fun time with friends and family and not feel deprived of what everyone else is enjoying? 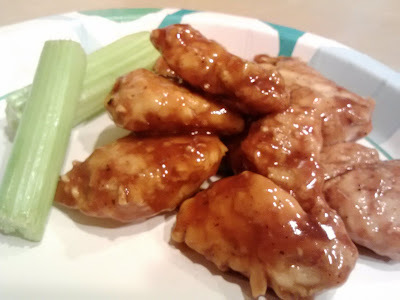 How about a healthier alternative to the traditional Boneless Honey BBQ Wings? Preheat oven to 375 degrees. Spray a baking sheet with nonstick spray. In a wide bowl, mix flour, salt, and black pepper. 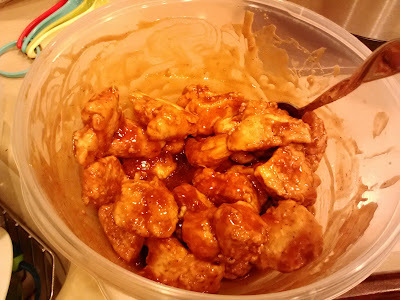 Place chicken nuggets in a large bowl, top with egg substitute, and toss to coat. One at a time, shake nuggets to remove excess egg and coat with seasoned flour. Evenly lay on the baking sheet. Bake for 10 minutes. Flip chicken. bake until outsides are lightly browned and chicken is cooked through, about 6 minutes. In another large bowl, mix BBQ sauce, honey, and garlic powder. Add cooked nuggets and toss to coat. TIP: Make sure you double or triple your recipe for a Super Bowl party. This is a recipe I found from Hungry Girl. YUM! Add a little fat free ranch or blue cheese and you are set! Everyone enjoyed them and they were very filling. They hit the spot and helped me feel like I wasn't being deprived.